A Stampin’ party + friends = FUN! Many thanks to my wonderful hostess Colleen K., who once again hosted a fabulous Stampin’ party for 5 of her wonderful friends! I just love being with these ladies; they have such a terrific sense of humour 🙂 Besides having lots to talk about with the new products in the catalogue, we’ve all ‘been around’ a while, so we never run out of interesting things to talk about! I’d also like to take this opportunity to welcome of these great ladies, Margaret Peters, to my team! Yes, Margaret couldn’t pass up the terrific deal of our Sale-A-Bration sign up offer; $195 in products for only $125! Plus the free business pack, and FREE Shipping!! One of the new items that I demonstrated was the Big Shot Die Brush. Everyone was so wowed at how easily it is to use, and how quickly & effectively it removes all the tiny pieces of cardstock from our detailed dies, that it immediately went onto the order of everyone who didn’t already own one! I’m going to do a quick video showing how to use it; you really do need one of these Big Shot Die Brushes if you use detailed dies. The Honeycomb Embellishment is perfect for topping off the ice cream cone! This stamp set is called – appropriately – Honeycomb Happiness, and is one of the FREE Sale-A-Bration sets that you can earn for free with any $60 order. We stamped the cones in Crumb Cake ink, then used the Mint Macaron and Watermelon Wonder Stampin’ Write Markers to colour in the ice cream. The banner is stamped in Mint Macaron ink onto Whisper White cardstock; it and the Melon Mambo piece behind it were given banner tails using the Banner Triple Punch. 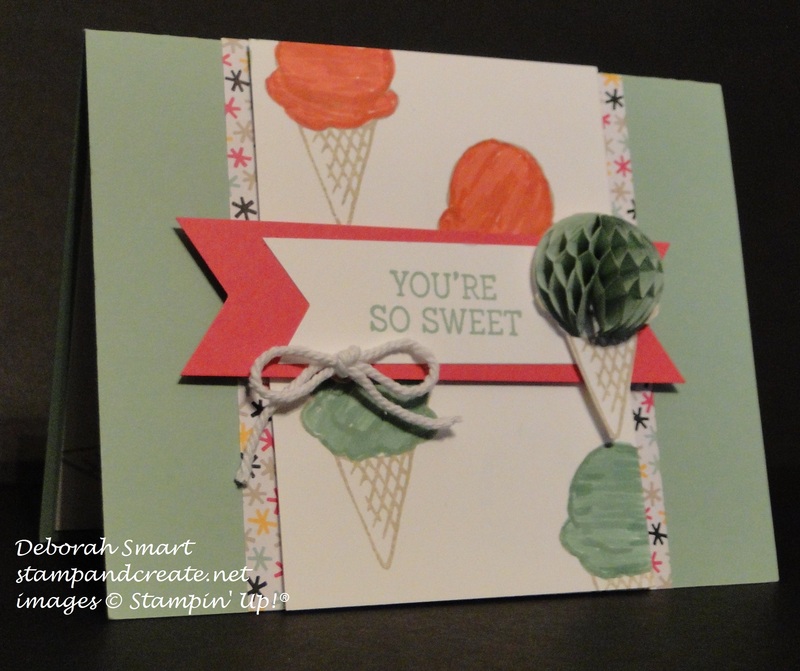 The DSP behind the stamped panel is from the It’s My Party DSP Pack, and the card base is Mint Macaron card stock. The card base is Bermuda Bay cardstock, with a panel of Basic Gray cardstock layered with a piece of Have a Cuppa DSP. Isn’t that kettle design fabulous!? 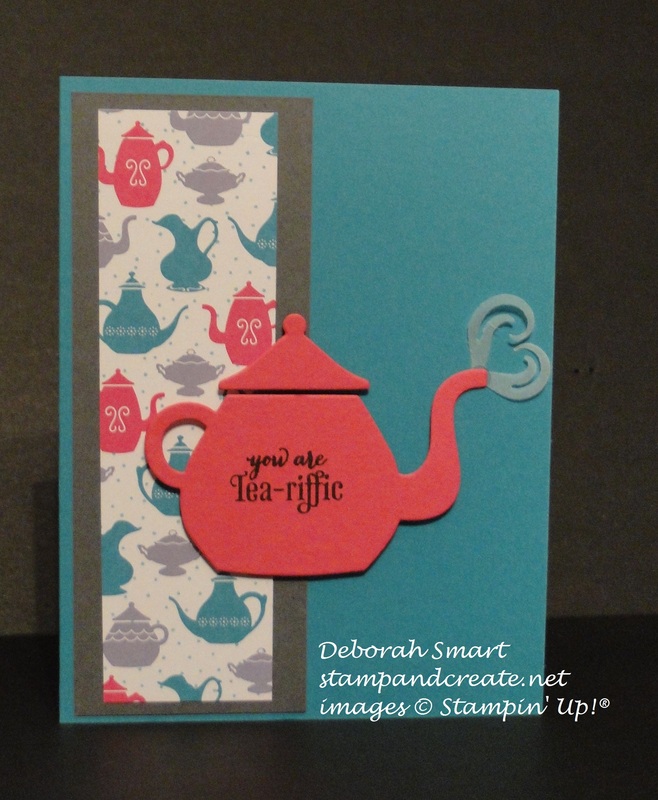 The kettle is die cut from Melon Mambo cardstock using the Cups & Kettle Framelits Dies. We stamped the sentiment directly onto the kettle, and popped it up on the card base using Stampin’ Dimensionals. The ‘steam’ was die cut from Vellum cardstock; I think it’s cute that it looks like a heart, but can be used as steam, as well. These 2 cards could definitely be ‘stepped up’ with more layers and embellishments, but for make & takes, where you want something not too difficult, and that won’t take a lot of time, these worked out perfectly. Thank you again, Colleen for hosting such a wonderful party! If you are like Margaret, and agree that the amazing sign-up offer of $195 in products (you get to choose the products!) for only $125, plus the free business pack, plus the free shipping of your starter kit is too good to pass up – then join up now! It’s super easy to do, and once you’re signed up, you can immediately start taking advantage of your 20% demonstrator discount on every order! Seriously 🙂 To JOIN MY TEAM NOW, just click HERE, and fill out your information online. Have some questions? Give me a call, or send me an email – 604.298.0472 or debsmart@shaw.ca To join my team you must live in Canada – but you don’t have to live in my neighbourhood! Along with my monthly team meetings, I also keep in touch with my team via phone, email and an exclusive team Facebook page. I hope to talk to you soon – I would love to have you join my team! Next Next post: Weekly Deals are WOW!